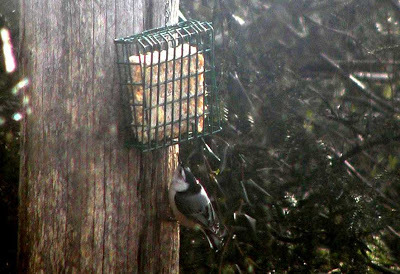 When you watch the suet and seed birdfeeders at the Inn on Mill Creek, you may notice a smallish bird with a big head, a short tail, and a white chest, with striking black and gray markings and black going over the top of its head, quickly scooting up and down and all around a tree trunk at weird angles. If he looks like the guy in the photo above, then you’ve seen the White-breasted Nuthatch, our March bird in the 12 Months of Birding series that we’re doing on the blog. The White-breasted Nuthatch is a songbird with a rather loud, lower-pitched song. All the notes are the same and go in rapid succession, ha-ha-ha-ha-ha, so to us it sounds a little bit like laughing. 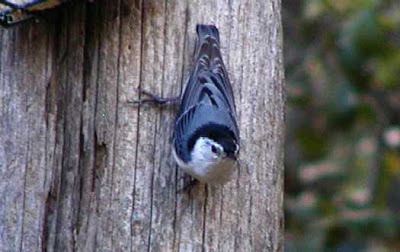 So if you’re outside at the Inn and you hear somebody laughing in the trees above, look up toward the larger limbs and you might see the nuthatch. were more wary and less willing to visit exposed bird feeders. We’ve got plenty of titmice, so nuthatches are very willing to visit the feeders. 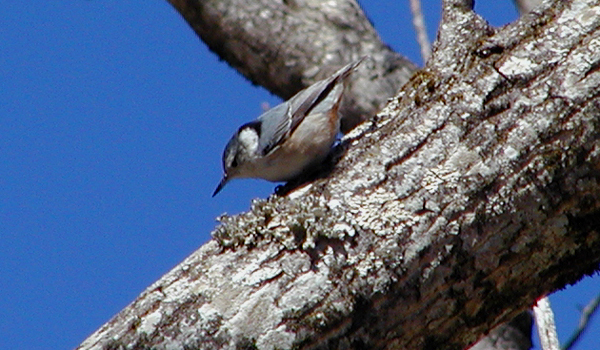 And they may be small birds, but nuthatches have a good appetite. They like insects as well as large seeds, like sunflower.They also love suet. And by love, we mean LOVE.